Bomb disposal experts successfully dismantled a British explosive in the small German city of Paderborn. 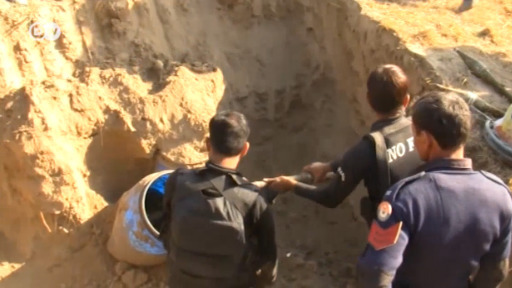 The 1.8-ton bomb was found in a garden just 80 centimeters below the surface. Bomb disposal specialists successfully deactivated a World War II in western Germany on Sunday. The 1.8 ton British bomb was found in the small city of Paderborn, about 370 kilometers (230 miles) southwest of Berlin. More than 26,000 people within a 1.5 km radius of the bomb were forced to evacuate their homes Sunday so the bomb disposal could proceed. Two hospitals and several homes for the elderly, a university and parts of the historic old town were part of the forced evacuation zone. Emergency shelters were set up, and more than 1,000 volunteers helped emergency services organize the evacuation. The evacuation was originally to be completed by noon local time (1000 UTC) but was delayed until early afternoon as it took longer than expected for people to be moved from their homes. According to the originally planned timing of the operation, people are due to return home by early evening. The bomb, which was found in a garden last month during construction work was found only 80 centimeters (31.5 inches) below the surface. Unexploded bombs from World War II are still regularly discovered in Germany even more than 70 years after the conflict ended, with US and British air forces estimated to have dropped more than a million tons of bombs on the country between 1940 and 1945 in the fight against the Nazi regime. In September last year, more than 70,000 people in the financial hub of Frankfurt were forced to leave their homes to allow a particularly large bomb to be disposed of. Eleven German bomb disposal experts have been killed in the course of their work since 2000. The 38-year-old Inayatullah Khan, nicknamed "tiger," is in charge of a bomb disposal squad in Pakistan's northwestern Dera Ismail Khan region. He has been critically injured several times while defusing explosives and even lost his leg. But Khan continues to perform his duty opposing terrorism.